We had a nice weekend. "S" got off of work at Noon on Friday and was able to spend some time sorting thru the priority mail that Dad sent before Rick arrived that afternoon. Rick unexpectedly brought his cat with him -- "Pebbles" is 18 years old and very frail and sickly-looking. We went to dinner at a place called "Benjamin's" in downtown Newport off of Thames Street -- a restaurant originally established by Benjamin Franklin. We ate at the same table that Johnny Carson dined (or so we were told). The light but succulent a la carte course left us room for mocha chip sundaes at a nearby Ben & Jerry's. Saturday morning, we again treated Rick to breakfast at one of our more favorite establishments -- the Ocean Breeze Cafe (check out part of their tasty menu at http://www.eatri.com/OceanBreeze/menDir.html). Rick had a helping of chocolate chip pancakes, "L" had a large bacon and cheese omelet, and "S" tried the more exotic (Azorean) Portuguese sausage (chourico) omelet. 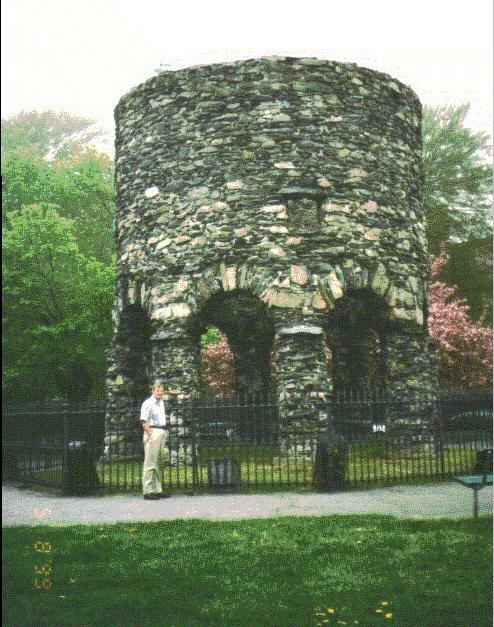 We walked off breakfast by swinging by the Newport Stone Tower, or "Old Stone Mill" (website forthcoming) in Touro Park at Bellevue Avenue and Mill Street. It is a famous Newport landmark surrounded by a cloud of mystery. Some believe it was built by Norse men long before the time of Columbus, while others date it sometime in the mid-17th century. 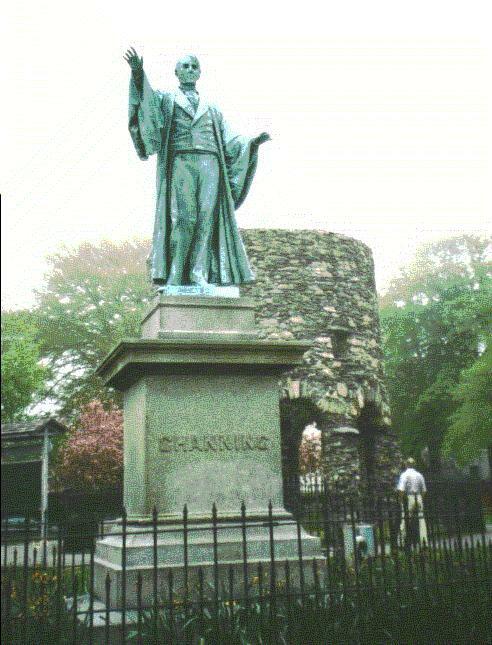 Nearby was a statue of Father Channing, who founded the church across the street. Rick's roving eye caught sight of the Hunter House next door to our apartment, and swung by for a closer observation. The sign at its entrance indicated that it was built in 1746, and served as the Headquarters of Admiral deTernay of the French Fleet from 1780-1781. 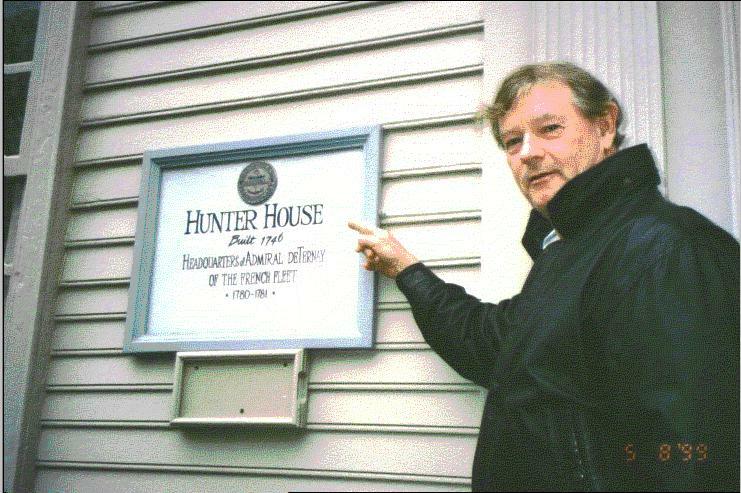 Rick just couldn't resist posing with this early-style "mansion" that reminded him of his friend George Hunter in Merritt Island, Florida -- whom we both dined with at Long John Silvers for dinner during our tumultuous years at the Space Center. 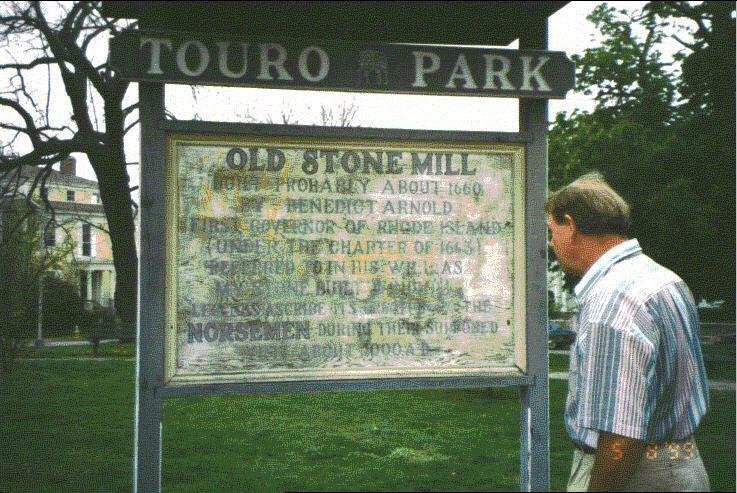 That afternoon, we all travelled to Fall River, Massachusetts to visit with Josie's (Rick's wife's) sister. "Irene" is a widow who lives in a nice large house with a humonguous slobbering and hyperactive dog named "CoCo". She was a very kind and part-deaf lady who provided us with grilled cheese sandwiches, pastries, and chicken dinner to take home. Rick, Irene, "S&L" then took an excursion to the Haffenreffer Museum of Anthropology located at the base of historic Mount Hope in Bristol, Rhode Island. A treasure house of exotic objects from around the world, the museum houses fascinating artifacts from the native peoples of the Americas, Africa, Asia and the Pacific. "S" took many pictures within and around the museum. Following our visit, we dropped Irene back off at her home and Rick left to return to his temporary stay with a friend in Schenectady, NY. We then rode home following our exhausting but adventurous and fun-filled day. Sunday morning, we awoke bright and early and dined at home on French Toast leftover from our Ocean Breeze breakfast of the previous weekend. After our usual weekly videoconference with Mom Flamm, we scurried out of our apartment to catch one of the first tours of The Marble House -- a summer "cottage" built in Newport between 1888 and 1892 for Mr. and Mrs. William K. Vanderbilt at a cost of $11 million, of which $7 million was spent on the 500,000 cubic feet of marble required for its construction. That afternoon, we toured Rosecliff -- another summer house designed for George Bancroft, a noted historian, Secretary of the Navy, and amateur horticulturalist who developed the American Beauty Rose. Rosecliff was completed in 1902 at a reported cost of $2.5 million and was designed for lavish and innovative receptions. Scenes from several films have been shot on location at Rosecliff, including High Society, The Great Gatsby, Amistad, and True Lies (where Arnold Schwarzeneggar danced the tango in its opulent ballroom). We then took a walk through downtown Newport and stopped at the Newport Creamery, a Rhode Island landmark dining establishment now owned by a Florida developer. Adhering to our motto "Life is Uncertain, Eat Dessert First", "L" had one with French Vanilla ice cream topped with Chocolate Jimmies, whipped cream, and a cherry, while "S" had a classic 2-scoop ice cream sundae with Coffee-flavored ice cream and "Cookies-&-Cream". We came home and ate our chicken; then relaxed the rest of the evening. Life is beautiful. Friday night, we went out to dinner at a chinese restaurant in Newport -- the Szechuan Panda II off of Equality Park Place near downtown Newport. It was good, and we had enough leftovers for the following Saturday and Monday evenings. Saturday morning, we boarded a bus at the Newport Gateway Visitors Center downtown (after paying $28/person) for a deluxe 4-hour tour of the entire Newport vicinity. The tour included visits to two (2) mansions of our choice, so naturally we chose those that we did not see yet. He also told of an eccentric woman in a big mansion that would hold unusual parties. One party was for over 200 "guests" -- pets, that is. The female pets were dressed in tu-tu's and the male pets were dressed in tuxedos. Another of her parties announced the attendance of a very important prince. The attendees came dressed to the hilt in eager anticipation of meeting this prince. When the prince was finally introduced, out came a monkey dressed in a royal costume. Everyone had a big laugh -- until the monkey jumped into the punch- bowl, then onto the chandelier and began throwing food at the guests! Other mansions passed as part of the tour included one of the man who invented the paper clip, another who comitted suicide because he was down to his last $40 million dollars, and another mansion on the grounds of one of the universities which was used during the filming of "Dark Shadows". As part of our tour in the morning, we visited "Hammersmith Farm". This 28-room "summer cottage" overlooking Narragansett Bay served as the summer white house during the Kennedy administration as well as the site where Jacqueline and President Kennedy celebrated their wedding. Vistas of Narragansett Bay, formal gardens, gift shop and a breeding farm for miniature horses completed the setting of this historic estate. Our tour in the afternoon included a visit to the Astor Beechwood estate. 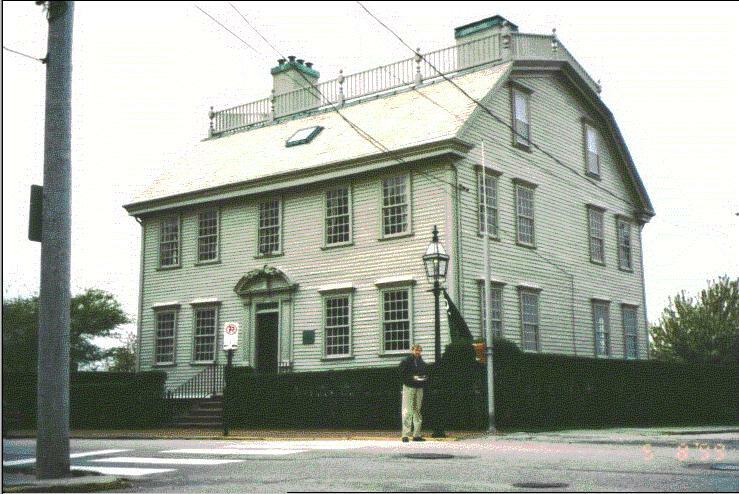 This mansion stood out because a local troupe of actors and actresses played out the occupants in costumes of the period. The year was 1871, and we were the invited guests of an exclusive party hosted by THE Mrs. Astor. Guests were forewarned not to make any mention of "The Titanic", as this took place AFTER the party took place, and the hosts would be very insulted. Sunday, we pretty much stayed in and played with our laptop, as the weather turned cold and rainy. We broke away to dine at a nearby Italian restaurant -- Sardella's -- our second visit. The food was tasty and creative, but our waitress tried to automatically charge us a 22% tip for her. Still, we have leftovers for dinner Tuesday evening. Wednesday, "S" will be taking "L" to Vanderbilt's -- a very exclusive, very expensive restaurant at the Hotel Viking (which charges up to $400 per night) for a very formal dinner. Why? Because he loves her! Also because right afterwards there is a seminar for "L", as she will be volunteering at the Newport International Film Festival being held the first week in June to meet with all the attending celebrities, including Bill Murray (or so we hope). Ahhh, a woman of leisure! "S" has to work! Her volunteer efforts pay off, though, as she will be receiving a free ticket for a premiere showing of a movie of her choice. "S" will buy his ticket, and most probably it'll be to see "An Ideal Husband" directed by Oliver Parker and starring Rupert Everett, Cate Blanchett, Jeremy Northam, Julianne Moore, Minnie Driver, Lindsay Duncan, and John Wood -- based on a 104-year-old comedic play by Oscar Wilde.